This map was made for a Beauty-design contest in ICU in July 2002. 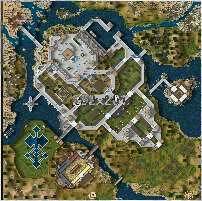 This map is eyecandy for SH only, it is not meant to be played. I hope, you'll like it. Nice map except for the fact that there is nothing to do but look but still very pleasing to the eye. mabye make and invasion or somthing to do next time might make people wanna download it. But some of the best eye candy i have seen good job. Very nice. Lots of stuff to look at, but I wouldn't buy it! "Fawlty Kastle" though harsh would do it justice. You see, the enemy can get right to the keep without breaching any walls. Schedule an invasion and see for yourself. Even if you do destroy the steps that give access to the walls from the OUTSIDE, there are so many steps inside that the enemy literally has only one or two obsticles in their path before gaining entry to the keep. This map shows a lot of promise and it's a shame to see it like this after so much work has been put into it. These problems can be fixed without too much altering to the map, and then you'll have a nice invasion level! Your map is amazing. By viewing it I got better grasp on the games’ potential for maps. I want to try a lot of the things I saw, still trying to figure out how to get peasants and have working building while editing. Thank you for sharing, must have took you forever to build. A lovely castle . What am I saying ? It's amazing ! The best I ever seen for Stronghold ! The only bad thing is , that if you try to train knights , they get stuck near the castle , and can't get through . Very nicely done. but again there should be some sort of economic aspect to this map. Godly!!!!! i would never have the patience or imagination to do what you did here. i especially liked the main body of the castle with all the different levels. It does open the keep up to enemies but hey it is more of an economic map anyways. being able to put this much into one map is beyond me. i especially loved the fountain in the bottom left corner. that peice alone allowed me to see what can be done in a stronghold map. Should contain (again) some economic aspects like "Gather Goods: Meat100, Cheese 100, and Apples 100"
i have to say i am very impressed. i just got into stronghold so idont know very much about the scenario design, but even me i can see aprceless masterpiece. Congratulations!!!!! !